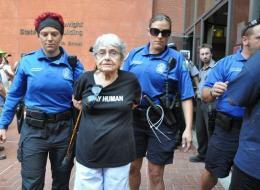 Hedy Epstein, a 90-year-old Holocaust survivor, was arrested on Monday during unrest over the death of Michael Brown,KMOV reports. Epstein, who aided Allied forces in the Nuremberg trials, was placed under arrest in downtown St. Louis, Missouri, “for failing to disperse” during a protest of Gov. Jay Nixon’s decision to call the National Guard into Ferguson. Eight others were also arrested. Epstein is currently an activist and a vocal supporter of the Free Gaza Movement. Tensions rose in Ferguson on Monday night after Nixon announced that the National Guard had been called in to help run the command center while police handled the protests. Several people were arrested as protests ramped up, including Scott Olson, a photographer working for Getty Images. “There is no excuse for excessive force by police,” Obama said.